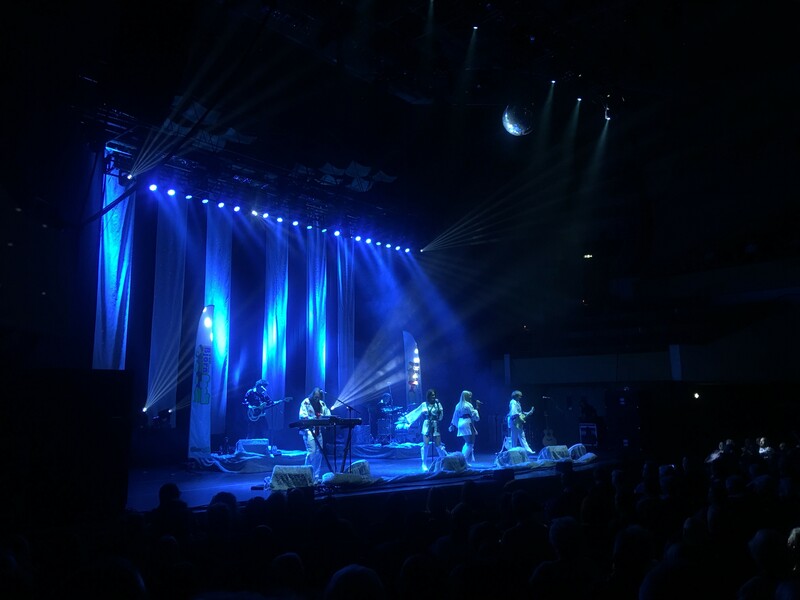 Our reporter Abby Wilson headed to St David’s Hall, Cardiff, to watch and review Björn Again’s opening night to their 30th Anniversary Tour. Yesterday evening, I had the pleasure of seeing Björn Again at St David’s Hall, for their first show of their 30th Anniversary Tour. As I entered St David’s Hall, for the first time, I was surrounded by a demographic slightly older than myself, with above 40 being the norm. Many came dressed in ABBA-like attire, with wigs, wide-legged one-pieces and thigh-high chunky boots present throughout. As a child, I grew up listening to ABBA, often belting ‘Dancing Queen’ and ‘Money, Money, Money’, thinking I had the equivalent vocals of Agnetha or Anni-Frid. Like myself, ABBA has provided the soundtrack for countless people’s lives, so it’s not a surprise that there were only a few empty seats in sight. As the audience patiently sat and waited for the shows commence, the excitement was ferociously building around the room, with chatter raising. Björn Again, the light-hearted satirical ABBA spoof was founded in 1988 in Melbourne, and the show’s ongoing success has amassed 5,000 performances in 72 countries in the past 30 years. Hailed as the most popular successful show of its type, I can understand why extra dates have been added to the tour due to huge public demand. With amazing choreography, aesthetically dazzling costumes and voices closely resembling the original band members, the show was definitely a hit. The much-loved ABBA repertoire performed all of ABBA’s greatest hits from the past 30 years, providing a wonderful evening full of singing, dancing and lots of fun, for all ages. After a few songs, almost everyone was off their seats, dancing to their heart’s content and singing at the top of their lungs. By the second half of the show, many openly danced in the aisles or manoeuvred to the front to get a closer look and show off their moves. The show was a noticeable mood-booster, with almost everyone, regardless of age, letting their hair down and letting loose. The resemble of the band to ABBA was truly justified and if you closed your eyes, you would have thought that the original Björn, Benny, Agnetha and Anni-Frid were performing in front of you. The historic status and legacy of ABBA continues to live on with Björn Again – with Björn Again actually going for twice as long as ABBA did! The show has achieved worldwide status and is acknowledged for singlehandedly initiating the ABBA revival which brought about ABBA Gold, and Mamma Mia! Björn Again’s tour has only just started, with Australian director and musician Rod Stephen taking the internationally acclaimed show on tour throughout the UK and Ireland in November/December 2018, with performances in Edinburgh, Belfast, Reading, Portsmouth, Guildford, Brighton, Birmingham, Oxford, and many more. A huge ABBA fan? What are you waiting for? You don’t want to miss this!